Delikon Catalogs Download --- Flexible Solutions For Demanding Applications. They are also designed to protect sensitive electronic circuits in applications such as communications, radar and data transmission. 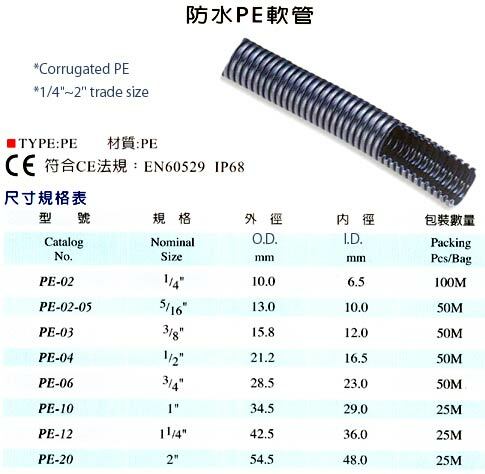 Electric Flexible Conduit systems for EMI shielding, abrasion and hot metal splashes resistance. Comprises a standard conduit construction, with metallic overbraid. Delikon Heavy Series Over Braided Flexible Conduit and Fittings system - solutions for your automation cabling protection! Delikon Heavy Series Over Braided Flexible Conduit and Fittings are specially designed for protecting electric and automation cables from the harsh environments found in steel mills, coke plants and glass manufacturing. Our heavy series over braided flexible conduit systems are superior in their ability to withstand heat, moisture and molten material splash and are highly resistant to mechanical and physical abuse. The overall stainless steel braid provides slag protection. Overbraided conduits are particularly suitable for installation in abrasive environments. Inherent low fire hazard, high mechanical strength. For Light Industrial, Lighting Power Track. 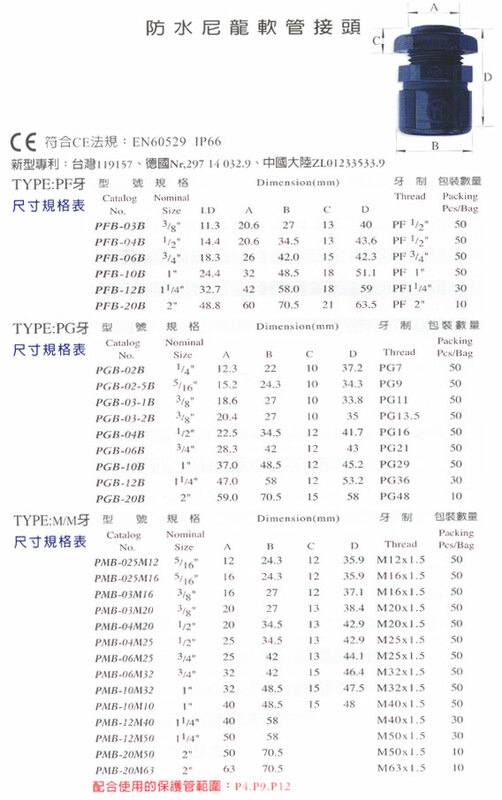 High Temperature Wiring : Connectors of all metal construction, most suitable for high temperature wirings. 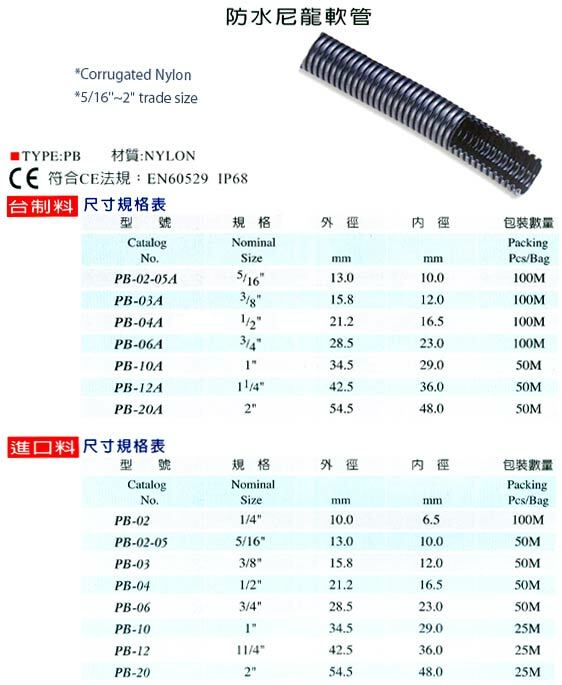 For Over braided flexible metal conduit and flexible steel conduit. Delikon produces a whole range of MS Plug Adapters for connecting a military connector (MS Fittings) or circular connector to a flexible conduit for industry cable management. Featuring: Delikon Heavy Series Conduit Fittings. Delikon Heavy Series Over Braided Flexible Conduit, Heavy Series Braided Conduit Fittings protect servo, feedback motor cables, PLC cables, control cables, instrumentation cables. Delikon heavy series braided conduit connector metal clamping ring design provides positive shielding termination, reducing electromagnetic interference EMI for cables. Modernization of steel plant will facilitate production of finished products with larger dimensions. 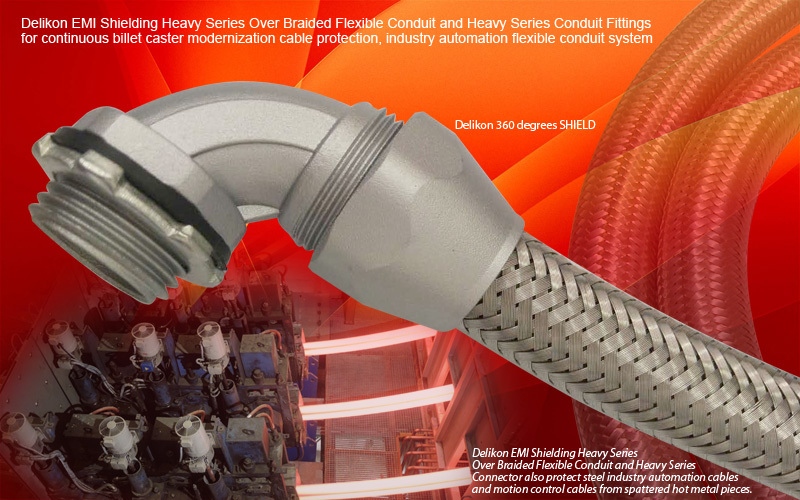 As a leading manufacturer, Delikon offers a complete product line of EMI Shielding Heavy Series Over Braided Flexible Conduit and Heavy Series Conduit fittings for cable protection covering machines used in every step of the iron and steel production chain. Delikon EMI Shielding Heavy Series Over Braided Flexible Conduit and Heavy Series Connector effectively isolate wires from the environment through which the cable runs, combating the effects of EMI. The heavy series metal connector clamp the over braiding tightly forming electrical contact around the entire periphery of the shield, providing a 360 degrees SHIELD termination. Delikon EMI Shielding Heavy Series Over Braided Flexible Conduit and Heavy Series Connector also protect steel industry automation cables and motion control cables from spattered hot metal pieces. Delikon EMI Shielding Heavy Series Over Braided Flexible Conduit and Heavy Series Conduit fittings are the best choice to protect the cables of electrical, instrumentation and automation equipment of continuous caster, improving product quality and reducing the maintenance costs. Aluminum Electrical Boxes, Conduit Fittings and other aluminum castings for a wide variety of industries. Pliable Conduits are easily bent by hand, and retain their shape when finally positioned, ideal for static or limited vibration applications. Braided conduit enhances screening. For Static or Limited Vibration Applications only. *Metallic Pliable Conduits are easily bent by hand, and retain their shape when finally positioned. CAUTIONS!!! DELIKON PLIABLE METAL CONDUIT IS INTENDED TO PROTECT CABLES THAT WILL REMAIN STATIC OR WITH LIMITED VIBRATION OR LIMITED MOVEMENT UNDER NORMAL INSTALLATION CONDITIONS. For applications where there is continually flexing or where there is a lot of vibration or movement, please use FLEXIBLE CONDUITS. applications are also available. Please write to us for more details. This Premium Quality Racing Hose features a stainless steel double woven braid for excellent performance and protection against extreme heat, corrosion and abrasion. Bonded Braiding could be cut easily without fraying. 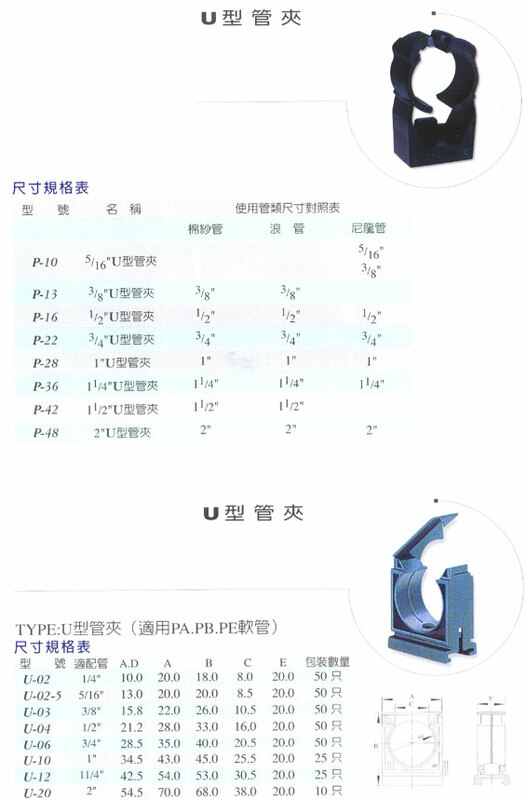 Annular or helically corrugated stainless steel hose, for conveying chemicals, gases, steam, etc. Stainless Steel Braided Pump Connectors are generally used for vibration absorption and the elimination of piping stress on pumps. Nylon braided rubber hose is constructed of a tough, abrasion-resistant Nylon sheathing, bonded to the textile inner braid embedded in the synthetic rubber liner. Maximum pressure rating: 350 psi Braided flexible conduit Systems for industry automation cable management: Over braided flexible conduit systems protect vulnerable cabling on metal machining, welding or heavy plant where abrasion, spillage and increased temperature are all serious operational considerations. The red end connects to AN Sizes high performance stainless steel braided hose and the blue end connects to an A.N. male end such as a pipe thread to A.N. adapter. For use with AN HOSE Metal Expansion Joints are generally used to absorb movement in piping caused by thermal changes. 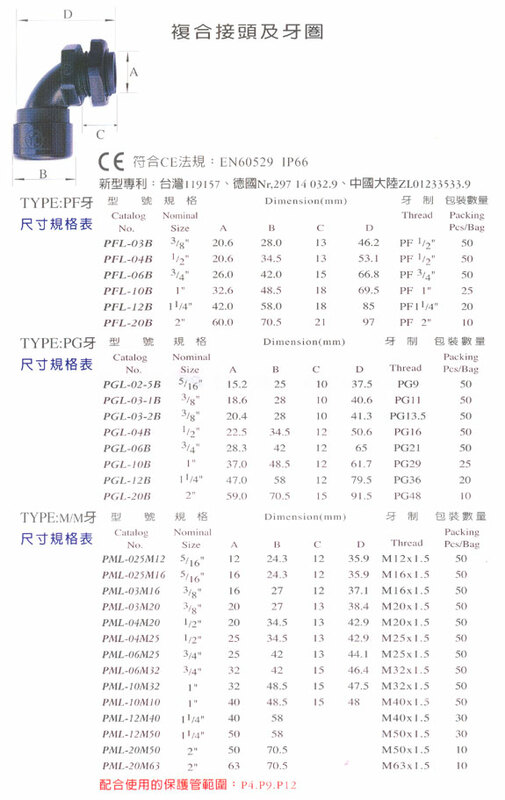 Most suitable for conveying machineries coolant, and drinking water. (for lower pressure applications. 1/4"ID up to 5/8"ID) This Stainless Steel Braided Nitrile Rubber Hose is for use with Magna-Clamp Fittings. Bonded Braiding could be cut easily. Pliable Metal Conduits for Microphones, Headsets, and table lamps. Delikon produces Stainless Steel Braided Racing Hose that offers unsurpassed levels of performance and reliability for your tough performance applications.